Despite the warm afternoon sun, the smattering of color on the trees at the State Hospital grounds in Traverse City is a subtle reminder: cold days are ahead. But now is the perfect time for exploring. The cultivated arboretum on the grounds can be a soothing respite for visitors today, just as it was for patients one-hundred years ago. 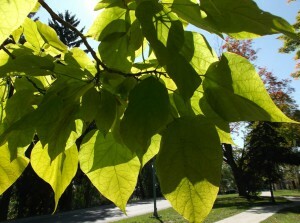 The large leaves of Catapa speciosa, native to southern Illionois, enjoy mid-afternoon sunlight and crisp fall breezes. 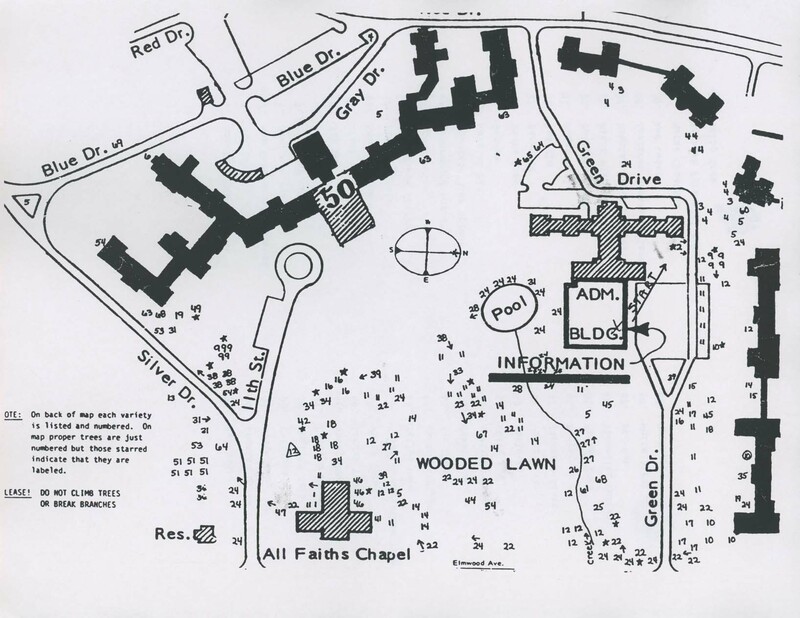 Twenty-five years into its operation, Munson would describe the site the State Hospital now occupies as the perfect candidate for a Kirkbride building, in that “this tract possesses an almost ideal combination of those features pertaining to an ideal site: a dry, porous soil, consequently healthy, eastern front-age for the buildings, an elevation sightly yet sheltered, an ample supply of pure, artesian water, and excellent facilities for drainage.” Although the site naturally had many of the qualities that promoted its use as an asylum, the wild forested areas and ragged hills that dominated the immediate landscape were not calming tonics for the nervous mind. Kirkbride advocated that the grounds of an asylum were an extension of the asylum itself, and should “be highly improved and tastefully ornamented; a variety of objects of interest should be collected around it, and trees and shrubs, flowering plants, summer-houses, and other pleasing objects, should add to its attractiveness. No one can tell how important all these may prove in the treatment of patients, nor what good effects may result from first impressions thus made upon an invalid on reaching a hospital”. Austrian Pine, native of southern Europe, with a bizarre limb formation. Many Kirkbride buildings have been demolished over the years, for as we are all aware, the care and maintenance of such structures is a costly endeavor. 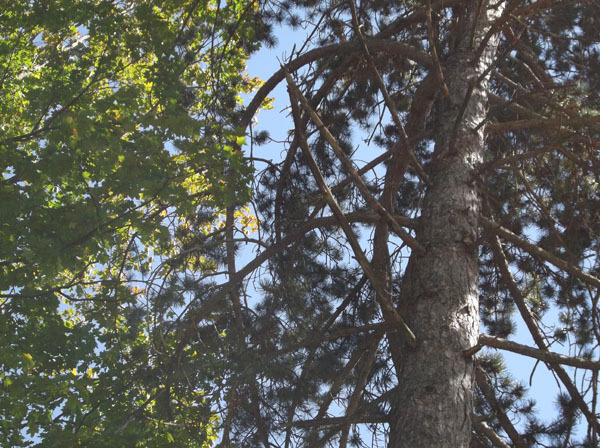 Fortunately, the State Hospital still stands, and the grounds are littered with many of the same varieties of trees that Munson and the Board of Trustees had planted as early as 1886. Care to walk the grounds with me? Print (or save to your mobile device) a copy of the map that appears at the end of this article, and we’re off! The grounds immediately in front of the institution are really fine, and have many interesting and attractive features. They have been carefully planted with trees and shrubs, and with charming effect. Much attention was primarily given to the selection of the trees, and an effort was made to plant all trees that would grow in this latitude. Among them may be found the salis burea, Kentucky coffee, mulberry, box alder, pecan, walnut, butternut, chestnut, hickory, the native beeches, elms and maples, the purple leaf beech, elm, maple, and the Norway maples in many varieties. These trees have attained some size and lend much beauty and interest to the grounds. Liriodendron tulipifera is fun for all ages. 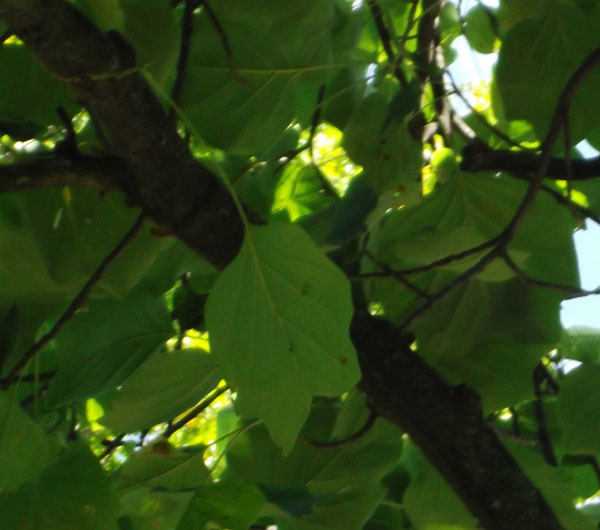 Look at the shape of the leaves; can you guess why its common name is Tulip Tree? This map is an interesting exercise; some of the roads and features are no longer present, as well as some of the trees, but it is still a decent reference for those wishing to traverse the arboretum. A librarian with a long memory at the Traverse Area District Library states that the map was created by the Michigan State Extension, probably in the mid-1980s, so it is clearly time for an update. That won’t deter us, though! The map legend claims that starred trees are labeled; after attempting to remain faithful to the map, I would have to say there were at least two separate attempts to label the trees. Some of the stars are accurate, but ultimately I found more labels than the map indicates. Being no arborist, I brought along a handy-dandy tree identification field guide with me, which I checked out from Traverse Area District Library, Woodmere Branch. I am not exaggerating when I say this is essential for your visit. Also, give yourself two hours; I was able to cover the highlights in one hour, but missed some of the more remote sections. With map and field guide in hand, I began on the south end of Building 50, looking for 49: Box Elder. Instead, I found a bizarre Austrian Pine, whose branches wrapped around and away from the building. Perhaps this native of southern Europe was reaching for more sunlight? 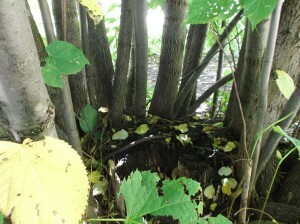 Basswood stump, what is left of the original plant, with volunteer trees surrounding. 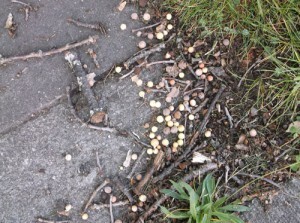 Near the Chapel, I located the Basswood referenced on the map (22), which lead to a happy discovery. Although all that remained of the original tree was a rotting stump, volunteer basswood trees were thriving all around the stump, making a neat refuge for little adventurers. That is the beauty of investing in nature; She has a tendency to give back more than we put in. By Munson and Kirkbride’s reckoning, my visit was a success. I especially found the natural light-filtering qualities of the leaves of Catalpa speciosa to be particularly soothing to my frazzled, post-summer mind. You’ll find this native of southern Illinois close to the intersection at Silver Drive and 11th Street. Ready to take the trek on your own? Remember, this arboretum is over 125 years old, so surprises abound. Enjoy the fall color, and don’t forget your map! Board of Trustees. “Report of the Board of Trustees of the Northern Michigan Asylum at Traverse City June 30, 1910,” available online through Traverse Area District Library’s local history collection: http://localhistory.tadl.org/items/show/2009. Kirkbride, Thomas S. “On the Construction, Organization, and General Arrangements of Hospitals for the Insane,” Chapter 22; available online through the National Institute of Health, US National Library of Medicine Digital Collections: http://collections.nlm.nih.gov/catalog/nlm:nlmuid-66510280R-bk. Mohlenbrock, Robert H. “MacMillan Field Guides: Trees of North America” (available for checkout at Traverse Area District Library). Amy Barritt is co-editor of the Grand Traverse Journal. Oak apples are clearly a fraud. Everyone knows oaks make acorns, not apples. Still, the term exists—and if you look carefully in mid- to late summer, you might even find them. Oaks grow in Northern Michigan, occupying the northern boundary of their range with few individuals being found in the Upper Peninsula. 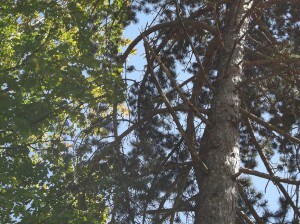 In Traverse City we can find white oaks—those with rounded leaf lobes—and members of the red oak group—those with pointed lobes. Gum Arabic, a gum from the acacia tree, was used as a binder for the ink; “victriall” (vitriol) was nothing more than iron sulfate, obtained from passing water through “sulfurous earth” and exposing it to iron. The resulting ink has a bold blue-black appearance, though it fades to brown as manuscripts age. Many of the world’s finest artists employed gall ink in their drawings, Rembrandt and Van Gogh to name two, and composers like Mozart regularly used it for their musical scores. The permanence of the ink is demonstrated by the masterpieces that remain for us to enjoy today. If apples are fruit, then oak apples are not—since they do not contain seeds. That being the case, what causes oak apples to form? The answer lies with a tiny wasp, Amphibolips confluens. In early summer the wasp deposits its egg on a young leaf. The egg and the larva that grows from it secrete plant growth substances that compel the oak to make the oak apple. After growing inside its comfortable chamber, the young wasp emerges to find a mate—both sexes are produced in equal numbers. After mating, the females crawl down the trunk to lay their eggs on the roots of the host oak tree. The young that hatch are all females,–a completely new generation! They spend the winter underground, feeding casually on the roots as needed, but mostly remaining dormant until the weather warms. When the young oak leaves are just the right size, they ascend the tree trunk to lay their eggs, thereby completing the life cycle. 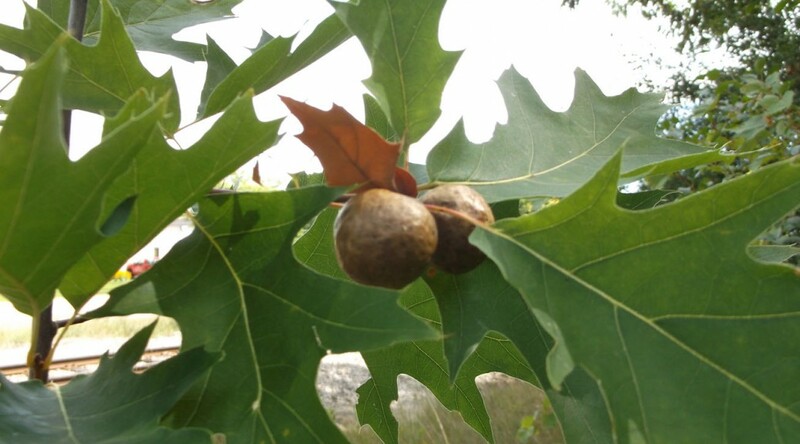 Oak apples are not the only galls formed on oaks. In fall in Northern Michigan white oaks shower the ground with pea-sized leaf galls, each one carrying a larva wasp. Acorns and twigs harbor still more galls, all caused by the same family of wasps, the cypnids. It is hopeless to wipe them out, the two species, wasps and oaks, having evolved together for untold generations. Besides, who would want to? Galls are fascinating objects and useful, too. 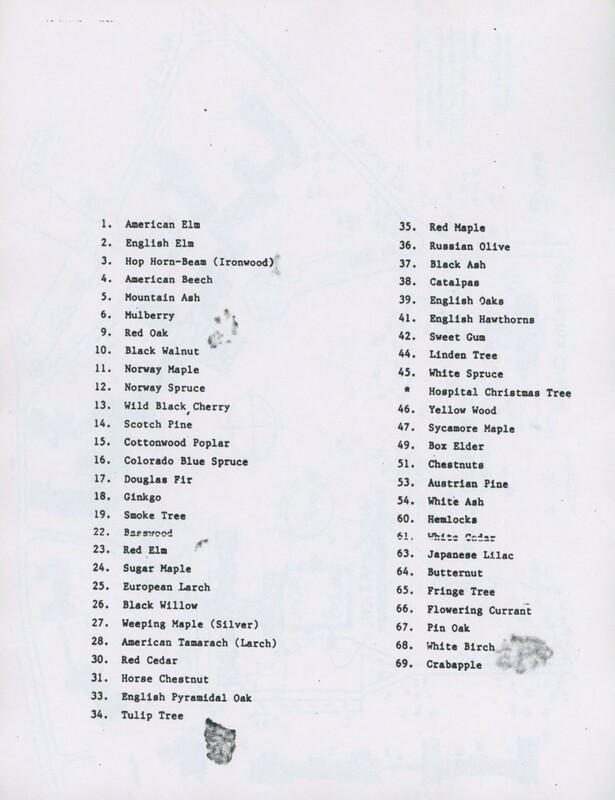 Won’t you find a tree full of oak apples and make your own ink this summer? 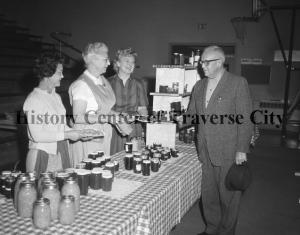 Gretchen (Arntz) Votruba, in the apron, at a St. Francis Bazaar selling canned goods, ca. 1940s. Gretechen was active in the Salvation Army and Child and Family Services and later at the Dennos Museum. Image courtesy of the History Center of Traverse City, Al Barnes Collection. The Women’s History Project of Northwest Michigan kindly contributed the following edited oral history, originally recorded in 2002. It is certainly timely; on October 9th, we will again regret the loss of Gretchen Votruba, who passed away on that date in 2004 at 88 years old. Gretchen was a volunteer with Child and Family Services in the Grand Traverse Region from 1960 until her passing. She was honored several times for her tireless dedication to the children and families she worked with, most notably in 1989 when she was honored by the State of Michigan as “Michigan’s 150th First Lady,” and again in 1995 when the Traverse City Chamber of Commerce awarded her their Distinguished Service Award. Gretchen’s example is one we should all keep in mind as the needy winter months descend. My daddy’s job took him to Cleveland when I was about 18 months old. I used to spend every summer with my grandparents. I would head up to Marshall as soon as school was out, and stay ‘til the day before it started. Grandpa and I used to do the shopping every day because we didn’t have any refrigeration. Fortunately, we were right next door to the milk station, so I could run over there and get milk at noon time. We’d keep it in well water that was wonderful and cold! Grandpa and I would go to the creamery to get butter. The floors were wet down there and I was always barefoot. That sure felt good after Main Street, because some days you had to hop because it was hot. My dad taught me to drive ‘cause they didn’t have driver’s training in school. When I was at home, he’d take me out in some of the new developments and places where the traffic wasn’t bad, so I could learn to turn decent corners and learn to park. The fact is, I think he made me change a tire. I had to change a tire before I could take the car alone. I went to Olivet to go to college. I started out being a camp counselor in the summers, and worked for the Battle Creek Campfire Girls. I became a Campfire Girls executive, but I didn’t like living on the dole from the Community Chest, so I went back to school to get a teacher’s certificate. I started teaching in ‘38. I knew Traverse City from having spent summer up here at Camp Arbutus. I just liked it and one of the other girls decided she liked it too; so the two of us moved up here in 1943. I was teaching school during World War II. We worked on saving grease and getting out ration cards because they used the school as an easy place so people wouldn’t have to go so far to sign up to get their sugar card or their meat card. I had the first Girl Scouts troop here too. We got started and went out collecting grease. I met my husband when his family were members of the First Congregational Church. I lived in an apartment on the same block when I first came to Traverse City. I knew his wife and I knew their kids. Catherine died in ‘46; their youngest was only two at the time. Bill was coming home from a Rotary Minstrel Show; he had black face and all. I was walking home across Union Street Bridge when he stopped and gave me a ride. We had a good visit that night, and then we started going together. We’d do things on Sundays with the kids and his mother. She’d have dinner and then we’d go for a ride. The kids always thought they had to be in the water, at least on Memorial Day, even if it was cold, they would make a quick dip. We got married New Year’s Day 1952, at the First Congregational Church Chapel. Bill’s father had come from Czechoslovakia when he was seventeen. His family went to the Bohemian settlement in East Jordan because they knew some people up there. He and his brother used to walk to Traverse City for supplies, and they’d carry a stool or a rocking chair home on their backs for their mother. One time his father and his brother got on the wrong trail when they were leading a cow back to East Jordan. They found themselves at the end of Old Mission Peninsula. They had to tramp all the way back and come up the other side to get to East Jordan. 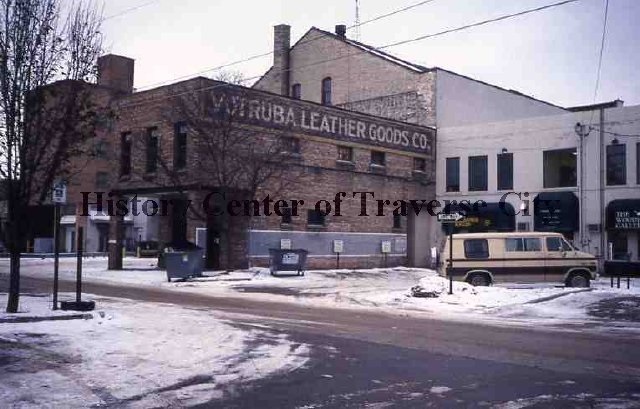 F. Votruba Leather Goods store exterior, 1996. Image courtesy of the History Center of Traverse City. Frank was his name, that’s where the ‘F. Votruba’ comes in on our store name. Frank was one of the builders of the Opera House Building. A matter of fact, ours is the only store still going from 1891. My work with Child and Family Services took me all around the country. I drove miles and miles getting new babies from hospitals, as well as sick kids. All of a sudden I’d get a phone call, ‘We’ve got a sick kid over in Elk Rapids… can you get over there and get him?’ I entered two or three children into the hospital at different times when they had to go in. I still see some of the kids around that I knew when they were little. It was nice because I enjoyed all the foster parents. They were really wonderful! The kids were so cute and the other kids in the families were so understanding. Oh, I used to take them and buy them shoes from (sic) when they needed ‘em and get haircuts and different things like that. That was real rewarding. Goodness sakes, we did travel miles and miles. 1989 was the 100th anniversary of our State. The Michigan Women’s Commission, under Governor Blanchard, selected Michigan First Ladies by counties. Each county go somebody in there. Most of ‘em have two; Grand Traverse was big enough to have three. The Women’s History Project of Northwest Michigan’s mission is to preserve and recognize the contributions of women to their families and communities in northwest lower Michigan. The Board of Directors are always looking for new interviewers for their oral history program, as well as recommendations for women to be interviewed. Copies of the oral histories and transcriptions are held at the archives of the History Center of Traverse City. For more information, visit the Women’s History Project website at http://www.whpnm.org/. Where is this Mystery Sculpture? This bronze sculpture, entitled “Autumn”, was made by Merab Berdzenishvili of Georgia—then a part of the Soviet Union–in 1990. Showing a woman holding grapes and a pomegranate, it celebrates the harvest at year’s end. The sculptor has achieved great fame in his homeland and still lives there—at least according to what information is easily available on the internet. Grand Traverse County came to possess this work of art at a time when the Soviet Union was collapsing. 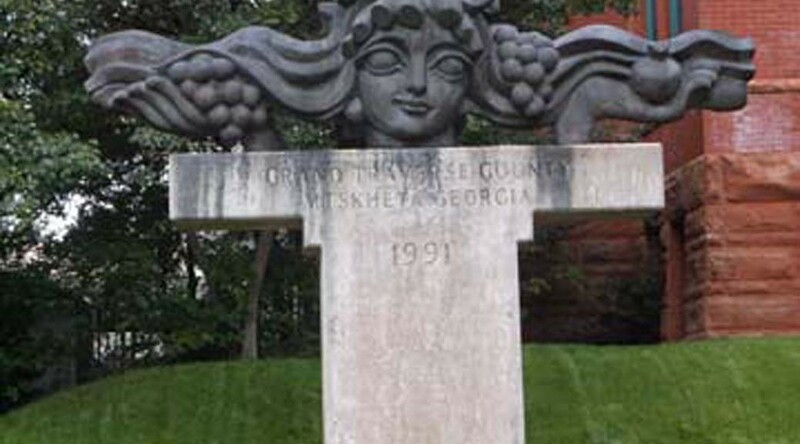 Delegations from this area and Georgia visited both countries beginning in 1989, the resulting cordial relations bringing about an exchange of artistic works, the sculpture for the County and stained glass designed by architect Bob Holdeman and artist Paul Welch for the Republic of Georgia. Copious amounts of thanks go to the Teen Sages of Traverse Area District Library, who were employed as free labor to illustrate this article. For more information and to get involved, catch up with the sages at http://www.tadl.org/teens. Supernatural manifestations at the haunted house near Boonville Monday night were eclipsed by adventures in a purely human realm—when Mrs. C.R. Rogers opened fire with a high caliber revolver on the half hundred sightseers who had surrounded the house to await the nightly appearance of the celebrated Fortney Ghost. So begins an article in the January 25th, 1922 Record-Eagle. Boonville was an eastern suburb of the city, extending south along present-day Woodmere Avenue for some distance. The house, itself, was situated “south of Hannah and east of Barlow”, an unprepossessing frame building constructed only ten years before the article appeared. No injuries were reported as a result of Mrs. Rogers’ fusillade of bullets: apparently, they were intended to scatter the crowd of onlookers, not murder them. 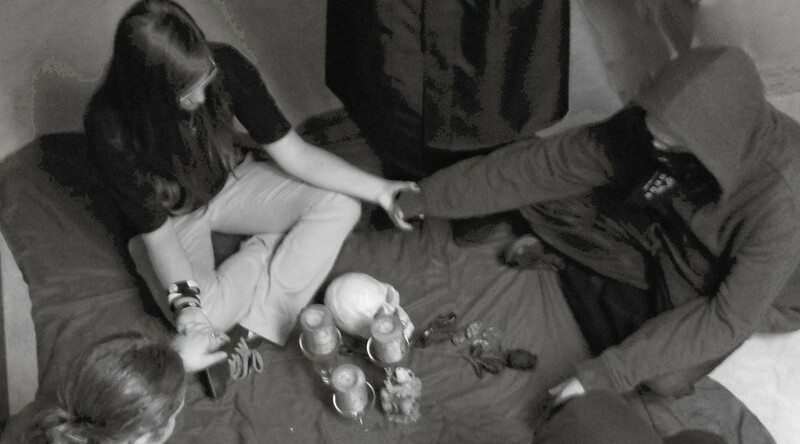 Teen Sages of Traverse Area District Library explore the terror of the unknown on the third floor, and get more than they bargained for. Perhaps the onlookers gathering at Mrs. Rogers’ property expected a similar encounter with the supernatural? She was unprepared for the host of visitors loitering around her house because she was not aware that the Traverse City Record-Eagle had previously published two articles detailing the “supernatural manifestations” that infested her house. Those manifestations included “a weird wail of a newborn babe, a light as bright as day that appears after midnight, and an eerie, luminous glow that cast fear into the hearts of onlookers. With such advertisement, what citizens of the town would not want to trespass on Mrs. Rogers property? It was not the first time the house was proclaimed haunted. Two years before, another resident of the house, Francis Fortney believed the building housed a female ghost (of about thirty years old) which abruptly vanished up a hole beside the stove pipe—this according to the testimony of Fortney’s wife’s seventeen-year-old brother, Frank McPherson. Mysterious floating lights also attended the haunting, their source unexplained and unexamined due to the absence of hand-held lighting. The newspaper account takes the boy’s story seriously: His story had a convincing coherence, an analytical sequence, a profusion of detail that lent it a genuine aspect. These were not the half-baked ravings of an adolescent. Fortney’s ghost—as the paper called it—dominated the front page for several days. 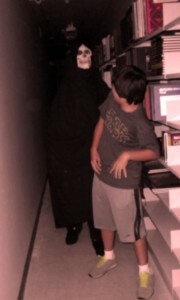 A newspaper reporter, taking courage in hand, explored the haunted house to look for evidence of the ghostly manifestations. As the family had abruptly fled (leaving dishes upon the table as they ran), he had the house to himself. The hole beside the stove pipe where the ghost disappeared was plainly visible as was a detached piece of beaverboard residents had tried to nail over it—more than once. Invariably it would come clattering down, no matter how firmly the nails were set. The ghost clearly had the strength to pry it off whenever she wished to do so. Other than that slim piece of evidence, there was no story to report from the home. An artists’ rendering of Fortney’s Ghost, thanks to our Teen Sages actor. Fortney’s ghost disappeared from the pages of the Record-Eagle as fast as the specter disappeared up the hole beside the chimney. The chief of police, John Blacken, subjected “French” Fortney and Frank McPherson to the “third degree”, firing questions at them one after another. Under the ferocity of questioning, they buckled, admitting they had concocted the whole story: it had started harmlessly enough, but just snowballed after that. Now, two years later, from the porch of the very same house that housed Fortney’s ghost, Mrs. Rogers was forced to break up a crowd by firing her revolver into the air over a new. A friend of Mrs. Rogers corroborated her account as least as far as the unexplained bright light was concerned. Only upon prodding his memory could he recall the crying of the babe. This time the Record Eagle seemed less credulous that it did in reporting the ghost episode two years previous. In the end, the latest haunting of the house went away as rapidly as the first. Mrs. Rogers recanted her account, perhaps because a resident of the house, Charles F. Howard, was sought for bootlegging, a common offense during the Prohibition era. Most likely she wished to get out of the limelight, her ghost story doing just the opposite—making her home the center of interest and controversy. Teen Sages reenact a seance for the purposes of educating readers, with nary a care for their own safety. What do these tales of hauntings tell us about the people of Traverse City who lived at that time? Is it unusual for newspapers to report stories of the supernatural? Why the inordinate interest in the supernatural, an interest that expressed itself in the assembling of “half hundred” onlookers in one case? Would such reporting gain traction with newspaper readership now? These are questions that probe the underlying values and customs of a different time. From the 1890’s through the twenties spiritualism was a powerful force in America and in England. Spiritualists—among them, Sir Arthur Conan Doyle of Sherlock Holmes fame—would attend séances conducted by guides to the spirit world. Ouija boards reached the pinnacle of their popularity in the twenties—Norman Rockwell even did a Saturday Evening Post cover of a couple manipulating one. They sat opposite each other with the board on their knees, their knees touching or not, a pose of extreme daring at this time. Their fingers lightly touched a token which would move over the board as they jiggled it with their knees. It might stop on Yes! if the question posed was, “Will I be divorced?” Or it might spell out a whole sentence in answering a question, the token stopping for an instant at appropriate letters. In any case, the toy appealed to those who took the spirit world seriously. The owner of the patent, William Fuld, made one million dollars in 1920, a sum that would have to be multiplied by 20 to convert to today’s money. Newspapers would occasionally tell about ghostly visitations within their communities, the story designed to attract interest–perhaps on a slow-news day. While a single story of a ghost might attract a few readers, a whole series of articles extending over five days would heighten that interest even more. That is what the Record-Eagle did in 1920, setting the story up in the second week of January. 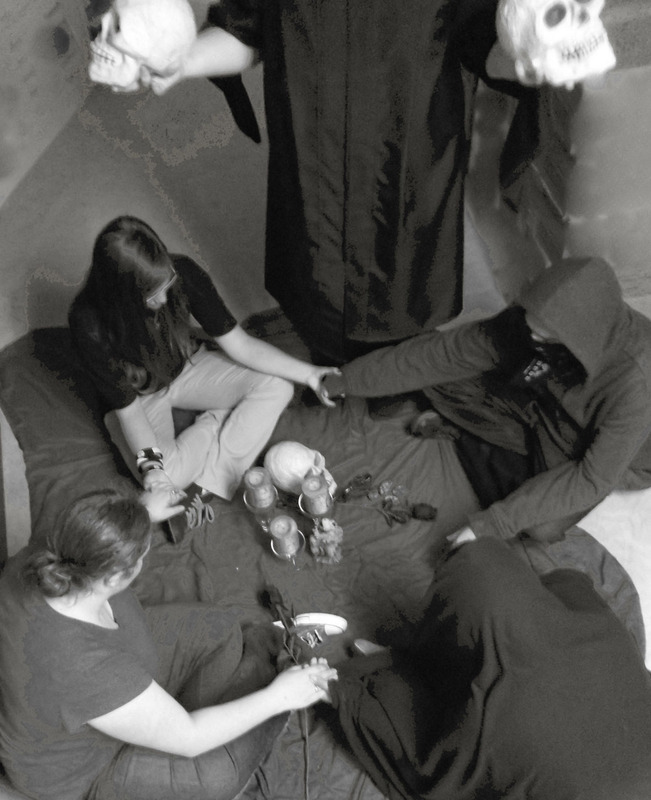 While the newspaper expressed a willingness to listen to first-hand accounts of witnesses, it stood back a little, not jumping on board the occult band wagon. After all, reporters were supposed to be journalists—and journalists should be skeptical of sources unknown to them. Nowadays occasional articles still pop up in magazines and newspapers, but they seem more like curiosities than genuine stories based upon accounts by reliable witnesses. They are printed wholly for entertainment value, not for insights into the world of spirits. It is unlikely a tale of a haunting would draw a hundred people to the site where ghosts, bright lights, and the wail of babes have all been observed. Or not. At bottom, how much different from our grandfathers and great-grandfathers are we? Architectural drawing of the front elevation of Old Mission Table, ca. 1927. The Bowers Harbor project was larger than most of Mr. Worthen’s homes. It was designed in what one architectural historian described as a stylized period house, typical of the design team’s work in the late 1920s. Paul Larson, co-author of St. Paul’s Architecture, described the house’s design in detail. “The front elevation of the house looks all Bentley — clean lines, balanced fenestration, sharp color demarcations. But the details … look all Worthen — picturesque mix of materials, loads of historicisms. So it must have been a joint design effort.” The home has many unique features and wonderful details in tile work inside and out. One feature is an elevator which was probably the first one installed in a residence in the entire region. 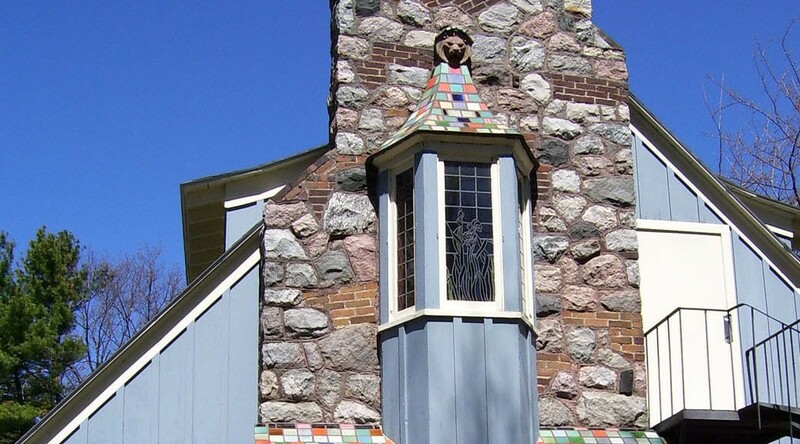 A Lion-like gargoyle at the peak of a stained-glass widow was a signature piece of Kenneth Worthen’s work– a detail he had used in other homes. 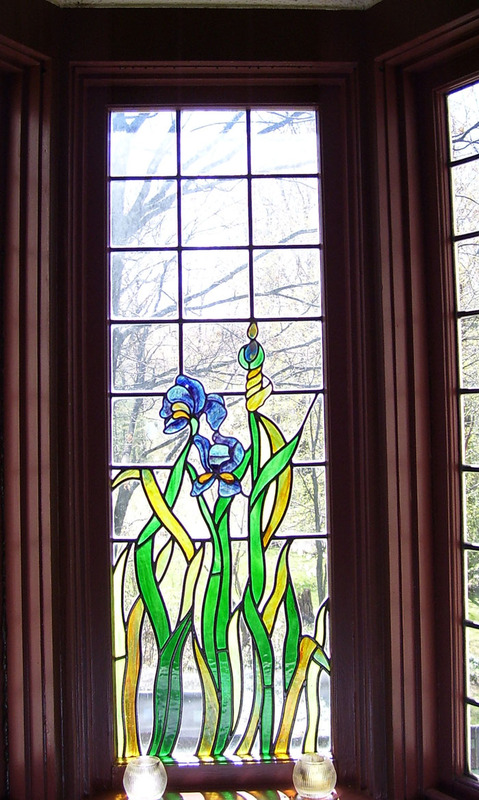 Several stained glass windows add more creative flair to the home. 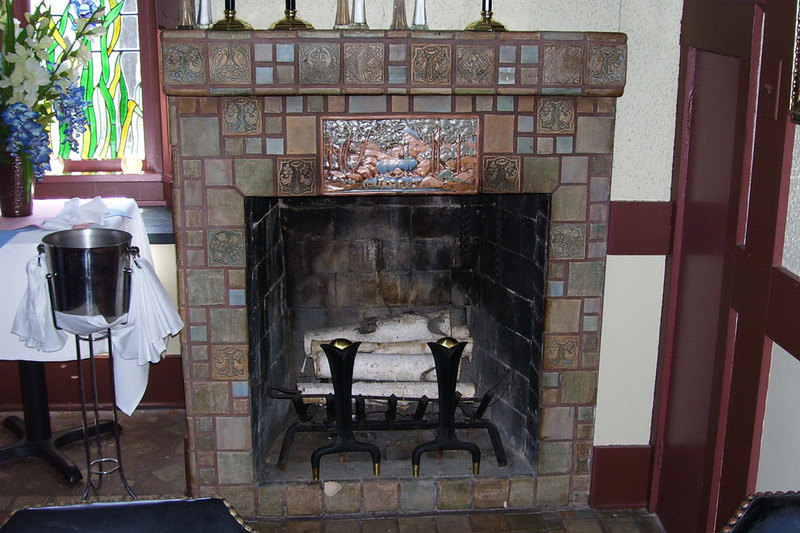 There are two large fireplaces, one on each end of the structure and three smaller ones in the upper bedrooms, each with unusual tile or stonework. The chimney of one fireplace is built of stone and irregularly placed bricks, typical in several of Kenneth Worthen’s St. Paul structures. 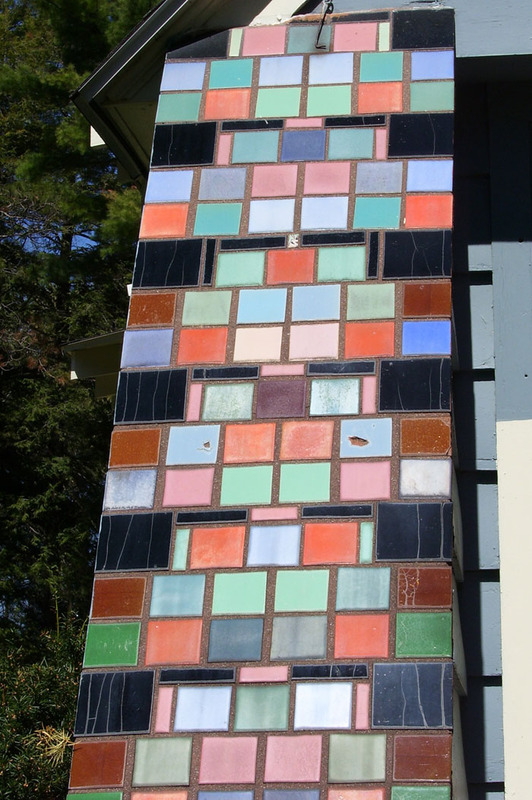 A stucco type wall, on one end of the home encloses a small courtyard, and is imbedded with colorful tiles, seashells, and stones collected by the owners. A large, graceful, curved iron hook once held a grand lantern near the front door. Cost to build the house was approximately $175,000, a sum well exceeding two million dollars in today’s money. The partnership of Bentley-Worthen was brief, lasting about one year, with both men going on to do other projects. The Bowers Harbor home may have been the last one Kenneth Worthen designed in the East before he relocated his family to California in the latter part of 1930, where he continued his career as a successful architect until his death in 1947. Tile work on an original fireplace surround. The Bowers Harbor home was built for Kenneth Worthen’s aunt, Jennie E. (Worthen) Stickney and her husband Charles F. Stickney. In 1909, Jennie purchased the Chester and Anna Hartson farm which was established in the 1860s. Wintering in St. Paul with Jennie’s sister Clara Mann, in Chicago with Charles’ sisters (or in warmer climate), the couple arrived in the spring, staying well into the fall. When their house was damaged by a fire in 1927, Jennie hired her nephew Kenneth to build a much larger home around the shell of the old farm house. Here they entertained family, friends, and fellow businessmen. Charles started in the shoe and boot manufacturing business as his father and grandfather had. He used his business skills to promote local farming, the business of harvesting, and food processing. Partnering with J.C. Howe, he established the Howe & Stickney canning company in 1910. The Bowers Harbor home was a working farm with the Stickneys hiring local men to run the farm and ladies to help in the house. Jennie enjoyed creating jams, jellies, brandies and pies from the fruits harvested on their farm and made it a point to serve them whenever they entertained. As they aged and their health began to decline, the Stickneys hired a personal nurse to care for them. Jennie suffered from diabetes, heart disease and–in her last years–possible early stages of dementia. Their nurse and her children lived with them in Bowers Harbor in the summers and accompanied them wherever they spent the winter. 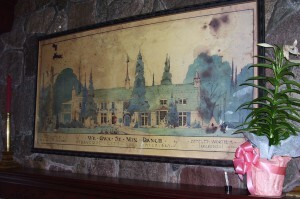 Mrs. Stickney died in Grand Rapids, Michigan at the Pantlind Hotel in March 1947, where they had a suite for the winter. Mr. Stickney, though confined to a wheelchair, continued to enjoy their Bowers Harbor home for two more years until his death at Munson Hospital in Traverse City, in August 1949. Numerous newspaper articles beginning in the 1970s report that the Stickney summer house is “haunted,” claiming that Mr. Stickney died first and that Mrs. Stickney took her own life in the house. These claims concerning the Stickneys’ deaths are unsupported by historical research. Another story has it that Mr. Stickney had an affair and donated all of his wealth to a caregiver, causing a jealous Mrs. Stickney to hang herself in an elevator shaft in the house. Whether or not Mr. Stickney had an affair, Mrs. Stickney did not hang herself in an elevator shaft in the house! The legends associated with the house vary, but are all unsupported by evidence. The bare truth holds less intrigue than tales of vast lumber wealth, infidelity, vanity and suicide that have spread locally over recent years. The real story is about two elderly people who needed help from their widowed nurse, a person to whom Mr. Stickney did leave his worldly possessions, but only out of respect and gratitude. With no children of his own, Charles felt his nurse was a perfect recipient of what was left of his estate. She had two children to raise and the Stickneys had come to care about the entire family. Others connected to the Stickneys and left out of the will may have felt entitled to some of the estate, that bitterness leading to jealous rumors about an alleged indiscretion between Charles and his caregiver. However the false stories started, they are nothing more than rumors and unsupported gossip. 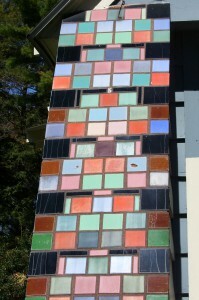 Tile work on the exterior of the structure mimics the colorful tile inlays found on the interior floors. It is widely reported by former owners, employees and visitors, that there is something unusual about the house. Some claim to have experienced phenomena pointing to Mrs. Stickney’s ghostly presence, often referring to her as “Genevieve.” Birth, marriage, will and passport documentation proves that her name was never Genevieve, but Jennie. The only document with the name Genevieve is her death certificate, signed by a physician who did not personally know her. He could have assumed Jennie was short for Genevieve, or, in her state of dementia, she might have started calling herself by that name. For 80 years she went by the name of Jennie, her given name. Perhaps the “ghost” experienced by many at Bowers Harbor is not Jennie at all. It could be Chester, Anna, Nida Hartson, who all passed away in the old farm house before the Stickneys arrived. Or, more likely, there is no ghost at all. If it is Jennie, however, it can only be because she lingered about her dearly loved, beautiful, unusual home–her one permanent residence, designed by her only nephew, the sole surviving child of any of her siblings. The fabricated myths need to be dropped. Perhaps if they do, Jennie’s “ghost”—the twisted memory of an honorable woman–can finally be put to rest. It is a shame that Mrs. Stickney, a woman with no one to defend her legacy, has had her life story so completely tarnished. Throughout the last few decades, the ghost stories have been a lure to bring people into the restaurant–as a glance at the Mission Table website reveals. 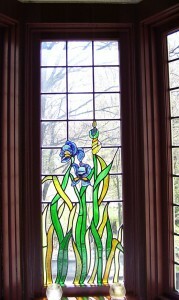 Unique details, such as the stained glass windows, sets the Stickney home apart from other local residences. Mrs. Stickney deserves redemption. It is the hope of the author that with the real story told, the house itself will be a new reason to draw customers. When people can finally look at the house—its true history and its glorious design–with new eyes, when they can study the quirky, exceptional details of its architecture, and when they forget the ghost legend, this splendid building will become recognized and respected for the showpiece of 1920s architecture it is. (1) Thank you to Donald Aucutt, architectural historian, who has studied the work of Percy Dwight Bentley, as well as other Midwest architects of this period. 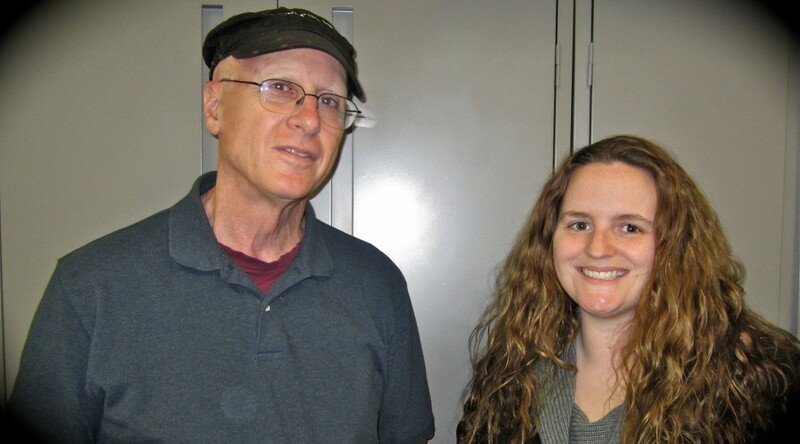 Julie Schopieray is a local historian and writer. Julie is currently working on a project concerning Jens C. Petersen, a Traverse City architect who practiced in this city from the early 1900s to 1918. 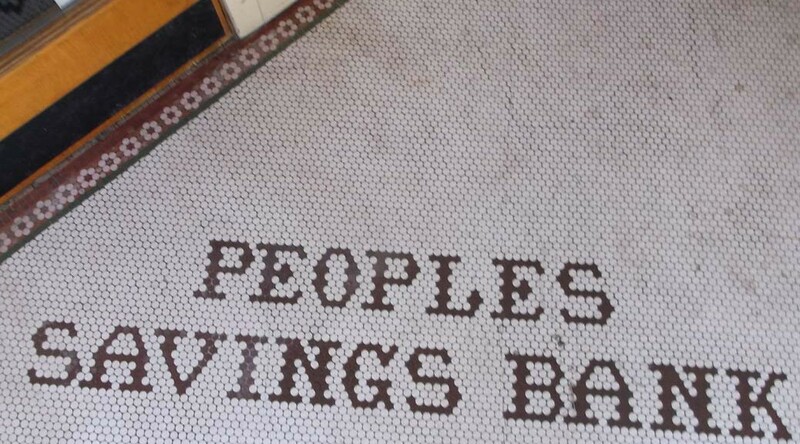 Perhaps you too have admired this tile work as you crossed the threshold of a local business in downtown Traverse City. But where was it? 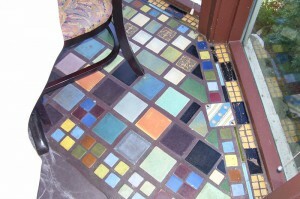 To see this tile design, visit Federico’s Design Jewelers on the south side of Front Street (p.s. You might have to move the mat aside!) Thanks to Marlas of Traverse City for the answer to September’s Mystery Photo! October is a month of the brightly colored leaves, the fall harvest, and Halloween ghostly tales. The present edition of the Grand Traverse Journal addresses all three topics. 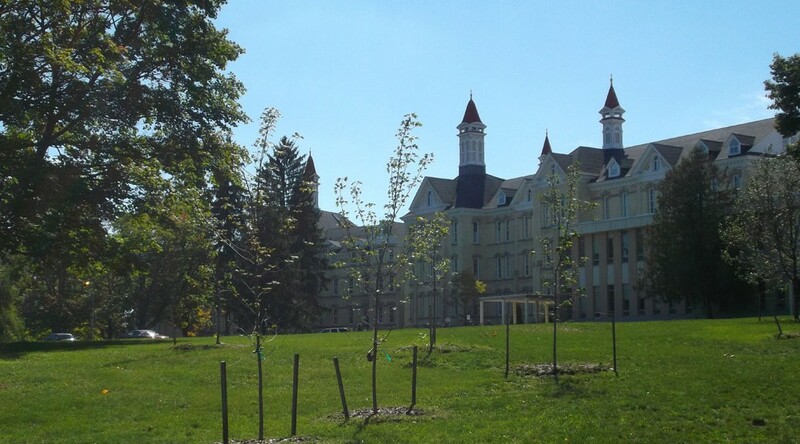 Amy Barritt reflects on the splendid arboretum surrounding the former Traverse City State Hospital, a park conceived by James Decker Munson, the first superintendent of that institution. Certainly, the leaves of sweet gum, tulip trees, and copper beech can be collected there before the first frost. The autumn harvest is celebrated in our mystery photo of a sculpture called by that very name. It was created far away in a place formerly regarded as enemy territory–part of the USSR–the Republic of Georgia. Readers should send in their thoughts upon its location as well as find out the answer to last month’s mystery photo. Apples certainly comprise a bountiful share of the autumn harvest in Northern Michigan, but what about “oak apples?” Richard Fidler explains how oak trees can produce swellings that superficially resemble apples, but hardly make ones you can eat. Not every “apple” has a crunch. 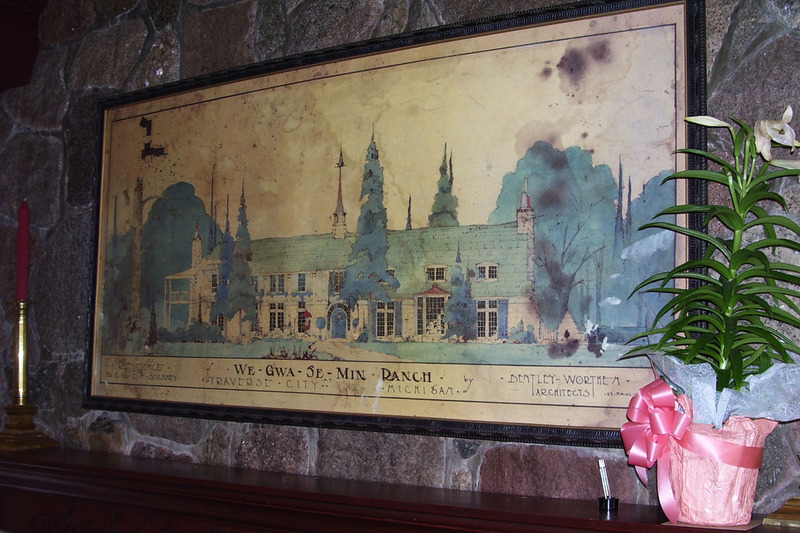 The lead article of this issue comes from Julie Schopieray’s examination of a famous building and a famous ghost tale of the Grand Traverse region: the Mission Table restaurant of Bowers Harbor (formerly known as the Bowers Harbor Inn). Not to give away the story, we will only say that the clear-cut splendor of an architectural treasure is to be appreciated more than a tale constructed from speculations and gossip. In the same vein, Richard Fidler looks at the widespread belief in ghosts present in the 1920’s. A home in our area had a major outbreak of the supernatural variety—or so it appeared. Alternatively, mischief could have been afoot, the ghosts staying clear to avoid the clamorous antics of curious onlookers. Read Fortney’s Ghost to learn about Traverse City’s fascination with the occult in an age of séances, mediums, and spiritualists. Finally, under Celebrate the People, we present an oral history recorded by the Women’s History Project of Northwest Michigan concerning Gretchen Votruba. The transcript dates from 2002 and only now, in 2014, we are able to publish it in abridged form. The Grand Traverse Journal encourages submissions of oral histories because they represent a form of history telling that intimately connects the life story of a single individual to an audience of readers.